January is one of my least favourite months of the year: diets seem to follow me everywhere, if not on TV adverts, but on the front-covers of magazines; all achievements from the previous year are forgotten about and reading goals are put back to '0' after hurtling through book-after-book in the final month to reach the target; and then there's that strive for the 'perfect' year - which is never going to happen. Although the weather has been awful and I have come back from school most days soaking wet, it's actually been a pretty-good start to 2014. I say this mainly because of the Fault in Our Stars movie-release. I decided I would try and write a novel in 2014 but the book hasn't had the best start. I started the New Year brimming with excitement over a plot-idea, and ready to get into my characters mind-set. The only problem is school has suddenly become serious; and GCSE's are just a few months away. This scares me a lot. Everytime I think about the future, it seems like it's coming too quickly, and that pressure of passing exams is going to bury me under an even bigger pile than my TBR. This is why I was extremely happy to get a letter saying another poem of mine would be published, as I adore writing poetry. Last time, I never got around to ordering the book, so have no idea what it looks like to have work of mine on a physical-page, and this time I'm hoping to actually see it! I want to thank everyone who has ever commented on a 'Wednesday Writing' post of mine - because you make me want to continue writing! I also hit 40,000 pageviews, which is incredibly surreal. As my first real blog-achievement of 2014, I couldn't quite believe so many people had read my blog(I remember when I had counted my own pageviews by accident, thinking I had 500 pageviews but really, it was only me!). Thanks again! Doing more for anti-bullying was another of my 2014 goals, and I never thought I could get involved in some of the projects I have since becoming a blogger. When Mojo Up approached me about doing something for anti-bullying with them, I couldn't quite believe someone in the Netherlands had found the Anti-Bullying Blog Week I did. In January, I wrote two articles for their Facebook Page, Mojo Up Nederland, one about making people feel worthless, and another about cyber-bullying, and although it's a small-organisation at the moment, I'm looking forward to seeing it grow and even just helping one person beat the bullies. 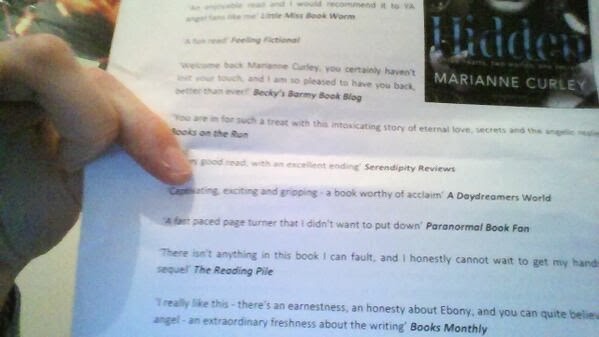 Thanks to Emma from Bloomsbury for listing me here! Last year, I adored reading 'Hidden' by Marianne Curley, and then I got an email about receiving a review copy of the next book in the series of 'Broken.' I was extremely excited about that, and then I realised when I saw the press-release that my review was on it! This is only the second time this has happened so, it's always a shock to see my blog's name under sites like 'Chicklish.' Another of my favourite books last year was 'The Fault in Our Stars' by John Green, and one of my highlights of January was finally seeing the trailer; which was absolutely perfect! I cried, okay? Hopefully, with half-term this month(finally! ), I'll be able to re-read 'Hidden' by Marianne Curley before I start the sequel! I hope you all had a fantastic January! What are you hoping to read this month? Thank you to Emma from Bloomsbury and Alex from Mojo Up! Ooh, congratulations on getting another poem published - that's amazing! A new year's resolution of mine was to finish a novel this year too, and I think I'm doing fairly well at 10,000 words so far. The best of luck to both of us on that one! Ugh, I hate January. I'm definitely more of a summer girl and the winter weather just makes me miserable. Bring on the sun! Thank you! I've managed 2,500 words, not the greatest start saying it is February, but 10,000 words is absolutely amazing! Good luck to you too! I think I'm a Spring girl, I love the weather we have in May! 2) I've heard Matched is pretty good. I'm definitely reading it this year. Thanks for recommending! 3) TFIOS is..... ASDFGHJKLKJHGFGHJKL. I can't. It's just too good and I hate how much I like it because it's so mainstream. But, yeah. I'm hooked. Only 4 months until the movie release!!!!!!!!!!!!!!!!!!!!! 1) Agreed! That's such a good idea, I may try that! I hope you are able to finish your novel soon; I definitely prefer writing short-stories! 2) Matched is definitely one I hope you do get around to! It's amazing! 3) I am going to spontaneously combust before the movie makes it to the cinema if I get anymore excited. 40,000 page views is awesome, and so cool to be featured it the press release :D Hope you have a good half term!